With a hand from technology, beginning birdwatchers may become seasoned pros in no time. Earlier this year, Subaru added a birdwatching app called eBird to its infotainment system. 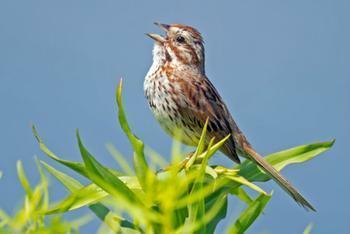 Now, binocular-wielding birders can use their smartphone as a bird song identification tool. Song Sleuth, a new app for iPhone users, aims to embellish a birdwatcher’s ornithological knowledge by offering up information on nearly 200 North American birds. Birders can use their smartphone to record, recognize, and identify the songs of nearby feathered creatures with the help of the app’s algorithm-based identification software. Song Sleuth says its software is similar in concept to what is used in speech recognition software, but specifically tailored to the unique acoustical characteristics of bird songs. Pushing past novice birdwatcher status will require a knowledge of bird species as well as bird songs, and Song Sleuth aims to help familiarize users with both. In addition to helping birdwatchers identify bird songs, the app includes a bird reference guide. "Song Sleuth is one of many tools that can help identify a bird, but its true benefit is helping people become better birders by familiarizing them with known birdsongs in a logical, familiar way," said bird expert and illustrator David Sibley, who lent his expertise to the development of the app. The way the app works is simple. To identify a nearby bird’s song, push the record button in “Record and ID” mode. When you are done recording, click the button again. From there, you will see the three most probable birds in the “Likely Matches” screen. To whittle down the list of matches, users can play example recordings of the likely matches, use the reference guide, or compare spectrograms of the example recordings with the recording created. Once the bird’s song has been matched to its species, you will have the option of geotagging the recording with the correct species, adding a note, or downloading the audio file to share with friends. Song Sleuth is currently available on the App Store, with an Android version expected to become available this fall. Winter bird feeding: what are the best kinds of foods to put out? Are bird feeders the fast food of the bird kingdom?